Increase payment conversions and reduce your cost to collect funds with a simple, user-friendly, payment experience delivered straight to your customer's mobile device. What are Mobile Payments from Esendex? Mobile Payments from Esendex are an innovative new way for businesses to collect funds from customers. Instead of relying on traditional channels like post and manual calls from agents, Mobile Payments use the Mobile Journeys platform to target customers mobile devices, and deliver a personalised, fully branded payment environment. As a fully PCI compliant platform, Mobile Payments provide both customers and businesses with the confidence that any payments are being made in the most secure way possible, while at the same time providing the convenience of a self-service platform which can be used at any time or place. We'll send a text to your phone with a link to the Mobile Payment where you can make a payment. Don’t worry - you don’t have to enter your real bank details. Who can use Mobile Payments? Here are just some of the industries that can benefit from more engaging payment journeys. Collecting payments from customers in the financial sector can often be extremely challenging. In many cases, the customer does not have the means to pay or simply refuses to. In the face of seemingly endless cutbacks, organisations in the public sector must maximise their opportunities to take payments, while at the same time reducing their cost to serve. Mobile payments can help with this by providing a fully automated payment service, which is cheaper to run than traditional communication channels like post. Tools like contactless payment and Apple Pay have made it easier for customers to quickly and easily make payments in store, but improvements for remote transactions have been a little slower to arrive. Using a Mobile Payment in conjunction with a Mobile Journey will make it easier to introduce customers to products and services, and then seamlessly take payment. Every person who owns or rents a home in the UK will have to pay a utility bill, but making sure that they all pay can be troublesome when relying on communication tools like post. Using a digital channel like Mobile Payments to prompt payment, and then provide a means to make payment as part of the same interaction is a proven way to increase payments, and make significant cost savings. What are the features of Mobile Payments? Here are the features which will help you collect more payments in a simple and secure way. The time to switch from a traditional payment receipt system to a digital, self-serve one is now! Customers no longer prefer the convenience of a collection system which can be used at any place and time, they expect it as a standard. 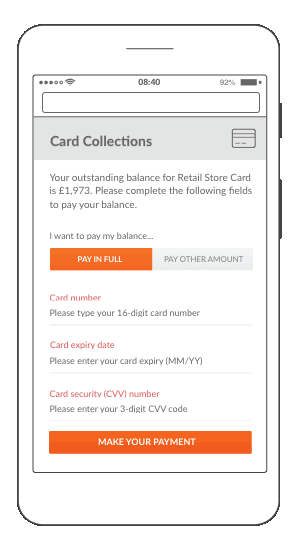 In our eBook (The Problem with Payments) we explore the negative impact of non-collection in UK markets, and the strategies which can be used (via more engaging mobile-focused communication channels) to maximise customer payments and reduce risk for businesses. So what are the benefits of Mobile Payments? Self-serve environment, which can be used at a time and place to suit them. Want to learn more about Mobile Payments?